Vigorous large shrub, new leaves emerge a silvery-pink turning to mid- green. 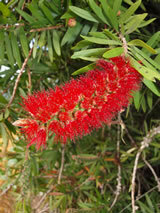 Masses of red bottlebrush flowers with gold anthers appear in terminal clusters in spring and autumn. Tolerant of poor dry soils, though prefers some moisture. Provides nectar for bees and birds. Good for hedging.